Functional Orthodontics and Fastbraces® are the revolutionary systems of fast, safe, easy and affordable braces for patients who have all of their permanent teeth. It is changing the field of orthodontics because it is a complete, non-extraction system, for most cases, which provides patients with outstanding results. Traditional braces move teeth into position in two stages, usually over a period of about two years. In the first year, the crown of the tooth is moved into alignment. In the second year, treatment addresses the position of the root of the tooth. However, the brackets used with Fastbraces® work on a different mechanical principle altogether. The patented system uses an innovative triangular bracket and a specially-shaped square wire to correct the position of the root of the tooth, from the beginning of treatment. This combination is key in realigning the root and crown simultaneously. Quality – Certified by the Inventor and made in the U.S. Many adult orthodontic problems occur from childhood habits, such as thumb sucking or bottle feeding while the infant is laying on their back. Interceptive orthodontics help correct skeletal problems that cause teeth to appear crooked when older. Many interceptive appliances are removable and easy to use for both the parent and the child. In many cases, further orthodontic treatment is not required with early interceptive childhood treatment. A thorough diagnosis is made by taking impressions of the mouth, along with a special x-ray which determines the size, shape and relationship of the upper and lower jaws. Based on the findings, a removable or fixed appliance may be required to correct discrepancies in the jaws. Slow, gentle pressure on the jaws correct any deficiency in jaw size or relationship. What are the advantages of EARLY INTERCEPTIVE ORTHODONTIC TREATMENT? Quality – Every case is sent off for computerised analysis in Australia and the U.S. If you’ve got any questions about the Whangarei Orthodontics treatment or anything else that concerns you, we are happy to answer them. Orthodontics is the process of straightening teeth. Orthodontics uses braces appliances and aligners to correct problems associated with the arrangement of teeth. Problems include crowded teeth that are not in a nice arch, teeth that do not line up with the opposing upper or lower teeth, protruding front teeth and over bites where the upper teeth close over the lower teeth too much. What types of orthodontic treatment are there? There are different ways to straighten teeth, conventional orthodontics and functional (orthopaedic) orthodontics. The majority of dentists and orthodontists use conventional orthodontics in the US and New Zealand, but this may not be a good thing. Only about 5% of dentists and orthodontists use functional orthodontics to treat their patients’ misaligned teeth. There is a fundamental difference between the two types. To understand the difference between these two treatment options, one must first understand what orthodontic and orthopaedic means. Orthodontic consists of movement of only the teeth. On the other hand, orthopaedics deals with the manipulation of bone. Another way of looking at it is that conventional orthodontics looks at the space available to align teeth and extracts teeth that may not fit in that space. While functional orthodontics looks at the width of all teeth and creates the space to fit all teeth by manipulating the bone. The use of conventional orthodontics has been widely used among American and New Zealand orthodontists to treat their patients. In the early 1980s, a general dentist by the name of Dr. John Witzig introduced the European way of treating misaligned teeth— functional orthodontics. European dentists and orthodontists treat all of their orthodontic cases with functional orthodontics and have been doing so since the 1920’s. What is the difference between conventional (traditional) orthodontics and functional (orthopaedic) orthodontics? Conventional orthodontics is started at a later age. Usually the orthodontist will wait until all the permanent teeth have erupted to start treatment. If there is not enough space for all of the teeth, conventional orthodontists extract teeth to provide more space in the mouth. Once there is enough space, the teeth are then straightened. 90% of the time, four bicuspids are extracted to create this space. The problem with this treatment method is that the patient’s facial profile becomes flat and less attractive. The patient will also have a narrow smile (showing only the front six teeth). Additionally, the teeth are pulled backward to close the gaps created from the extracted teeth, which may lead to temporomandibular dysfunction (TMJ) and/or airway and breathing problems. Functional Orthodontics, on the other hand, is started at a much younger age. Treatment can begin as early as 7 years of age. While the patient is still growing, the orthopaedic orthodontist will use gentle appliances to expand the arches in the mouth to gain space for crowded teeth. By making the arch wider and longer, all permanent teeth will have enough room to fit. This is an orthopaedic treatment (movement of bone). While the upper and lower arches are expanding, the lower jaw is repositioned in relation to the upper jaw. As a result, it creates a much better facial profile for the patient with a broader smile, without any teeth being extracted. Also, since the lower jaw is being repositioned forward instead of backwards, it improves the the way the jaw joint (TMJ) functions. Functional orthodontics uses braces or clear aligners as the final procedure to straighten teeth. Therefore, it uses both orthopaedic and orthodontic modalities to treat the patient. In summary, Conventional Orthodontics allows the straightening of teeth; but can lead to a narrow smile, a flat facial profile, and the possibility of future TMJ or breathing problems. Functional Orthodontics, on the other hand, treats the patient as a whole: the face, the TMJ, and finally the teeth. As a result, it gives the patient a much better facial profile, a nice broad smile, and a healthy TMJ, all without the need to extract teeth. If a dentist or orthodontist is treating his or her patients with conventional orthodontics, he or she may not be providing the best possible treatment, depending on the circumstances. Functional orthodontic dentists and orthodontists use both orthopaedics and orthodontics to treat their patients. This combination provides the best possible treatment methods known today. After all is said and done, it is ultimately up to the patient or parent to decide how they want to straighten their teeth or their children’s teeth. How do I know what type of orthodontics I need? In order to determine what type of orthodontic treatment is required to correct your, or your child’s, misaligned teeth, we must collect some information on your teeth and bones that support your teeth. The dentist will take some photographs, x-rays and models of the teeth to determine which type of orthodontic treatment will be required. Photographs are taken of the teeth and face to evaluate crowding, facial profile and the alignment of the upper and lower jaws. These pictures are used to point out visible problems associated with the arrangement of the teeth to you or your child. The dentist can see underlying issues with the bones that support the teeth that cause any facial abnormalities. A panographic x-ray is taken that shows all the teeth in the upper and lower jaws as well as any abnormalities in the jaw bones and jaw joint (TMJ). The dentist can see any teeth that have not erupted yet to be sure all baby teeth will be replaced by a permanent tooth. The development and position of wisdom teeth can also be seen. From this x-ray, orthodontic treatment can be planned to compensate for any missing teeth and the limitations of tooth movement due to teeth root development. Measurements are recorded from the models of the teeth to determine if there will be enough room for all teeth to be aligned in the upper or lower jaw. By age 7, enough permanent teeth have usually erupted to predict the required space all permanent teeth to be present in the size of the existing upper or lower jaw. Then, based on these measurement, the dentist can determine if any type of expansion is required to allow for all teeth to be properly aligned in adults and children. If this is the case, then some type of orthopaedic orthodontics will be required. If there is plenty of space and only misaligned teeth, then conventional orthodontics alone can correct the problem. If the dentist suspects there are some issues with the arrangement of the bones in your face, a special x-ray, called a cephalometric x-ray, is taken of your head. This x-ray is a profile view that allows the dentist to see the relationship of the entire skull and the position of the bones that support teeth. A computerised analysis is performed on this X-ray which will determine the size and position relationship of the upper and lower jaws to each other and to other structures of the skull. Then, orthopaedic orthodontics will be used to correct any discrepancy. There are many types of braces available today. For conventional orthodontics, there are braces that are glued onto the teeth that are made of metal or a clear ceramic, as well as aligners that are made from clear plastic to align teeth. Orthopaedic orthodontics uses fixed (non-removable) and removable appliances that move the bone that supports teeth. Conventional braces, whether clear or metal, are the main type of braces used. The advantage of conventional braces is that treatment time is relatively short and many types of movements can be applied to teeth to position them correctly. However, they are not removable and require extra care for daily cleaning. For some cases, conventional braces are the only option to correct misaligned teeth. Clear aligners, or Invisalign®, use a series of plastic trays to move teeth. A computer will analyse models of your teeth and 3D print subsequent a series of models with slight variations until the desired result is achieved. A dental lab will make plastic trays form the series of models that will slowly move teeth. Each aligner in the series is worn for 2-3 weeks until the next aligner is worn. The advantage of clear aligners is that they are relatively invisible and can be taken out to clean and eat. However, clear aligners have a limited range of movements that can be applied to teeth and are not suitable for all cases. Orthopaedic orthodontic appliances can gain space in the upper or lower jaw by widening the arches, moving the entire arch forward or backwards as well as making the arches longer. There are many types of appliances used, some removable and some cemented in place, depending on the appliance and its application. There are even appliances that are worn on the face and connect to teeth on the upper jaws to correct under-bites (where the lower front teeth are infant of the upper front teeth) in kids. How long does orthodontics take? Everyone wants to wear braces for as short of a time as possible. Some teeth can be straightened in as little as 6 months while others will wear braces for 2-3 years. If orthopaedic orthodontics is used, there may be more than one phase of treatment where appliances are worn for a year or so as young kid and conventional braces worn for a year once the child has matured. The average time for our patients is about 18 months, many including some type of orthopaedic orthodontics at the same time as conventional orthodontics. Regardless of the time it takes to correct the position of your teeth, it is short in comparison to the lifetime enjoyment of nice looking teeth. 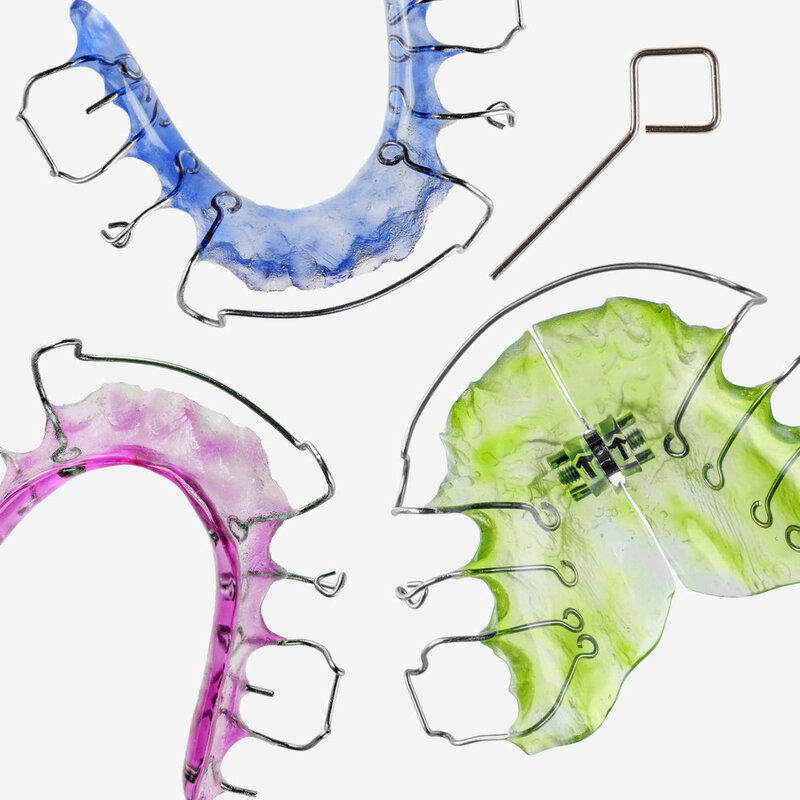 Retainers are used to hold teeth in position after orthodontic treatment. In most cases, retainers are worn every night for siz months after orthodontic treatment and then slowly weened off for the next 6 months. A permanent retainer is placed on lower front teeth that will be worn for many years. There is no hard and fast rule for retainers after orthodontic treatment as teeth will move if there are forces applied. This means that if you continue to thrust your tongue against the back of your front teeth, your tongue will push those front teeth out. Or, if you always rest your palm agains your face while sitting at a desk, your teeth will slowly move. You can tell if your teeth are moving after orthodontic treatment by skipping a night in wearing your retainers. If the retainers feel tight, then the teeth are moving and you should continue to wear the retainers every night.